With the election nearly three weeks behind us, I guess it’s time I finally wrote a blog. My loyal readership (both of you) has been asking repeatedly when I will unleash my pen. I’ve had so many conflicting thoughts; I honestly haven’t known where to start. So, I’ll start with my Election Reflection 2012 blog, written four years ago almost to the day. Then, as now, I let things settle in for a few weeks before I penned anything. I was so unhappy with the outcome in 2012 (another four years of an already failed presidency and a missed opportunity with a really good man in Mitt Romney) that I needed to calm down and gather my thoughts. Clearly [Bruce] has never read NYM. And at a certain point I’m done. Don’t know the gentleman and everyone is entitled to a political opinion. Unfortunately, this time around it’s gone beyond politics into amateur fascism and scary people. So as Kim mentions above, this isn’t R v D. This is humanity v despicable folks. Not worth discussing. This will take civil disobedience, dissent, resistance and maybe some real fighting. The worms that have crawled out from their Momma’s basements and holding each other’s manhoods while raising their limp wrists in a quasi Nazi salute are play acting and waiting for the appropriate moment to break out the leather and boots. Yeah. Good ole time boys. So, no. I won’t weigh in on these classic bullies. NEVER AGAIN will get ugly this time…for the leather clad, jack booted Weiner Schnitzles in training. So me out, they can get off the pages and sites of humans and enjoy StormTrooper monthly and the other blurred face sites. OK, so I voted for Donald Trump because (a) Obama was terrible, (b) Hillary is terrible, and (c) the country is a mess and needed a change for the better. Trump wasn’t the ideal choice, but he was the only viable choice given that fact pattern. It’s totally OK to disagree with me on the merits of that decision. But, here’s a guy some might have otherwise believed to be a rational voice of the left (publisher of two well-known magazines) with some of the most vile and threatening language I’ve ever been subjected to at any time in my life. Seriously, in what alternative universe is this OK? This is the party of love and inclusion? Hey Alan, I don’t feel very included right now. 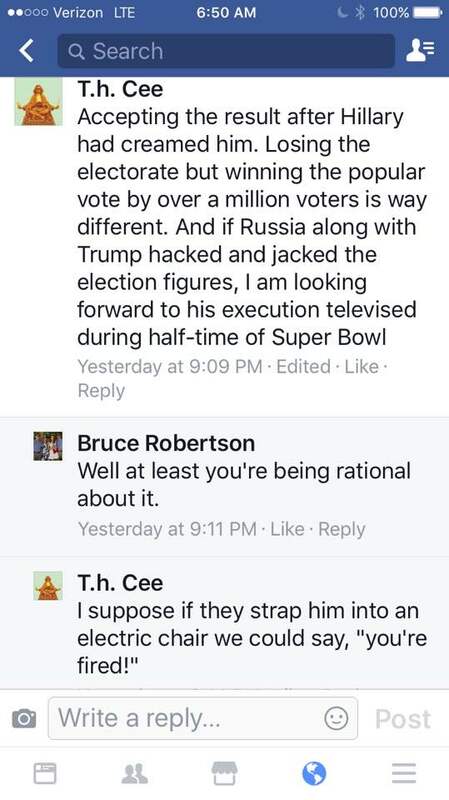 Furthermore, does anyone see the hypocrisy in the left ranting about how afraid they are and how they have to quell their children’s fears over Trump while they are making overt threats like this to people they’ve never met? No kidding, I’m a little afraid to even post this. Then again, I’ve made a blogging career writing about liberal hypocrisy (here, here, here, here, here, and here). It’s what keeps them going. So, to summarize, my first and most powerful post-election observation is that the left is completely unhinged. Speaking directly to them: you lost an election, not a family member. You’ll live. Read my graceful summary from 2012, written in the wake of defeat and disappointment, and see if you can’t find a more graceful path of your own, one devoid of nastiness and threats of physical violence. In fact, maybe just practice the love and inclusion you preach. My next observation also goes back to my 2012 post-election reflection and also involves a self-congratulatory pat on the back. I was right! I was completely right! The gist of my 2012 post was that I would be just fine, but I also commented that, “My primary sadness is what this means for the poor and the middle class. They got completely fucked.” (Sorry about the colorful language, but I was in a bad mood!). There’s little doubt that Obama’s weak economy and anti-growth tax policies slowed down my personal wealth creation, but, just to be crass, I still played golf at my country club every weekend since 2012. Not so much the poor and the middle class. As the economy continued to stagger under the weight of Obama’s hyper-regulatory anti-growth policies, those at the bottom and in the middle got hammered the most. So much so, in fact, that they’ve now thrown in their lot with Mr. Trump, an unlikely ally with whom to do so. Whether he’s the answer to their woes will play out over the next 4-8 years. But, the debate on whether Obama could help them is now closed. This prediction, more than anything, explains the outcome of the 2016 election. This election had nothing to do with racism, misogyny or any other deplorable -ism. Trump won a greater percentage of the black and Hispanic votes than Mitt Romney. Case closed. As exit polls clearly demonstrated, Trump won on the issues. However bad Trump may have been (and he was a highly flawed candidate, to say the least), Hillary was far worse. She was devoid of ideas and is clearly a self-centered, untrustworthy liar. Had she been anyone else with an unbiased Attorney General, there’s no doubt she would have been indicted for her mishandling of classified information. I find it astonishing that the left could spend a year demonizing Donald Trump (often with good ammunition), but could never look in the mirror and see their own demons. Yet regardless of the facts, most liberals and their friends in the media continue to view Mr. Trump’s victory through a self-serving racial lens. Today, race is the Democratic Party’s organizing principle. Group identity is a doctrine and group grievances are to be nurtured and exploited politically no matter the damage to civil discourse. It’s the type of thinking that allows the left to be outraged that the likes of Steve Bannon have Mr. Trump’s ear, and are indifferent that the likes of Al Sharpton have had Mr. Obama’s. Just weeks prior to the election, folks were writing eulogies for the Republican Party. A day after the election, that same party controlled the executive and both legislative branches of the federal government and had a clear line of sight on controlling the Supreme Court. They also controlled the vast majority of governorships and state legislatures. I’m sorry, tell me again which party is dead (or at least seriously wounded)? The liberal mainstream media sealed its fate as irrelevant. I predicted this a long time ago (here and here). I don’t know how big a factor it was, but at the margin, voters voted against political correctness. Everyone supports equality under the law, but when you suggest it’s OK for a man to use the women’s bathroom at the mall, you’re off the rails. If liberals want their children to stop being afraid after this election, they would be well-served to stop spewing lies about the risks of a Trump presidency. There’s not a 5-year old on the planet that could come to that conclusion on his or her own. Parents who do that to their children should get a knock on the door from social services. Finally, on January 23, 2009, just three days after his first inauguration, Obama said to then Republican Whip Eric Cantor, “Elections have consequences, and at the end of the day, I won.” He was right and this is a lesson liberals need to embrace again now. A liberal friend of mine commented to me last week that liberals would feel better about this if Trump would just nominate some moderates for his cabinet posts. Uh, no. Obama appointed extremists like Eric Holder at DOJ and Gina McCarthy at EPA. Don’t look to conservatives to put up moderates now.